Snowfall forecast for Wednesday's nor'easter, as of Tuesday morning. The biggest change to what I've said in previous forecast is an earlier shift in the timing of heaviest snow/rain. Our weather will remain quiet and fairly pleasant during the day Tuesday. Early sunshine will give way to clouds and high temperatures in the seasonable mid 40s. Light precipitation still looks to arrive around 7 p.m. Tuesday, spreading through the entire state by about Midnight. The Wednesday morning commute could get a bit messy, but overall travel conditions should be OK. From late morning to early evening Wednesday, all bets are off as snow, sleet, and rain pour from the sky. We'll taper off to showers Wednesday night through Thursday morning. I have adjusted my snow forecast based on the latest model trends. I opted to add a fourth color contour to my snow map, in an effort to add some more detail to the forecast. 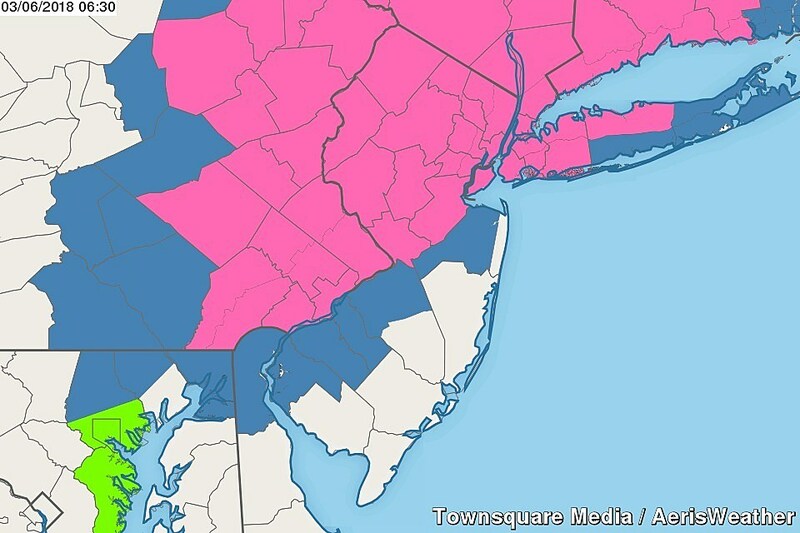 The overall range of potential snowfall for New Jersey remains at 0 to 14 inches. By the way, this is going to be heavy, wet snow. Hard to shovel and tough on already-vulnerable trees and power lines. With first raindrops and snowflakes now less than 24 hours away, the time has come to upgrade watches to warnings. A Winter Storm Watch continues for northwestern Burlington, Camden, Gloucester, inland Monmouth, and Salem counties, from Tuesday evening through late Wednesday night. I'm certain NWS is waiting until the last-minute to see how the final snowfall totals will fall — this watch will probably be upgraded to a Warning or downgraded to an Advisory by Tuesday afternoon. I think some forecasters are overestimating and overhyping the wind potential from this nor'easter. Yes, it's going to be windy, with gusts of 30+ mph inland and 40+ mph along the coast. That's certainly enough to cause sporadic power outages, especially as trees and power infrastructure remain weakened from the last storm. But as windy as the last storm? No way. 60+ mph gusts (like the last storm) seem highly unlikely. 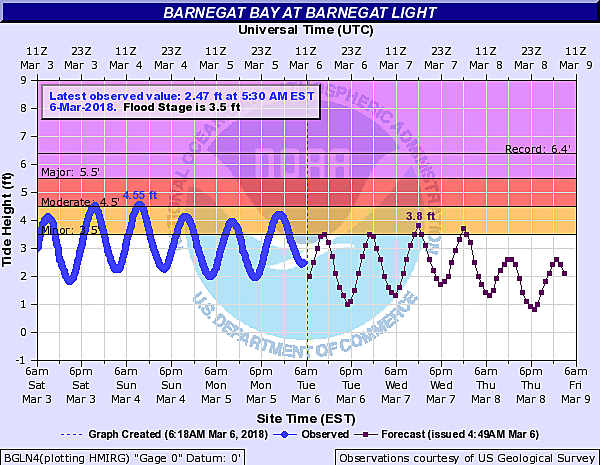 Tide guidance is holding steady in the 1 to 2 foot range, peaking during Wednesday midday's high tide cycle. Water levels are expected to be lower than the surge from Friday's storm, and we're in a period of lower astronomical tides. It will be enough for minor flooding, necessitating closures of vulnerable roads next to tidal waterways. Of course, as we have discussed, tide forecasts are very sensitive to the precise wind speed and direction. Worth watching, but not worth panicking over. No forecast is complete without an expression of the forecaster's confidence — how sure they are that the forecast will come true. Furthermore, I like to sit back and analyze how my snow forecasts could go wrong due to storm track wiggles, dry slots, etc. There are definitely still some question marks about this storm's track and temperatures. But I feel good about what I've presented here. The bottom line: Wednesday is going to get incredibly messy, especially through the afternoon and early evening hours. 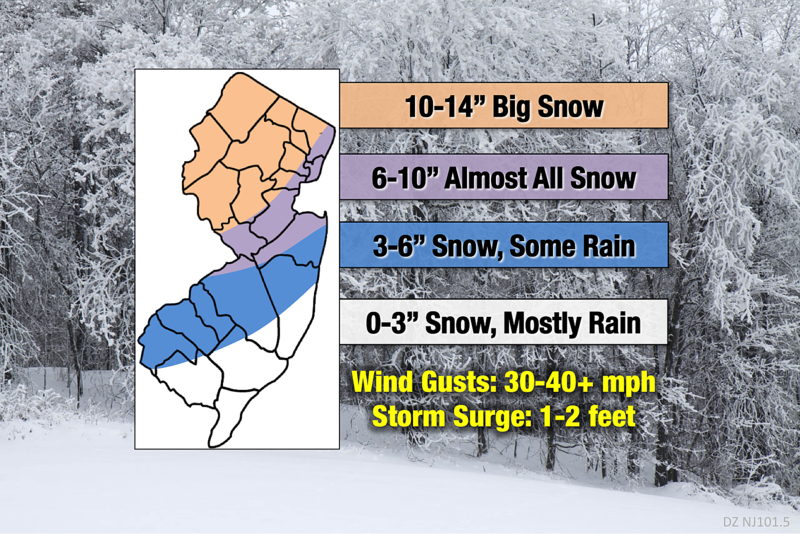 If the storm wiggles just 30 miles west, snow totals will underperform as rain becomes a more predominant precipitation type away from the Shore. In this case, snow totals would end up about 4 to 9 inches lower than my going forecast. If a slot of dry, sinking air pops up over New Jersey during peak snowfall, totals will also underperform for some area of the state. On the other hand, if the storm wiggles just 30 miles east, snow totals could overperform as colder air enacts a more thorough changeover from rain to snow/sleet. I've seen model guidance suggest snow totals as high as 18 inches for this storm. I expect numerous schools in the warning area to close on Wednesday and Thursday. Where the heaviest snow falls, a closure may be necessary on Friday too, due to prolonged snow cleanup and power outages. Other districts with lower snowfall expectations may consider an early dismissal with cancellation of afternoon activities on Wednesday, followed by a delay or closure on Thursday. And just know that if you're working a regular workday on Wednesday, and/or plan on traveling in the Garden State during Wednesday evening's rush hour, it's going to be absolutely miserable. At best, rain (along the coast). At worst, heavy snow. Next weather blog will be posted Tuesday late afternoon, hopefully around 5 p.m.